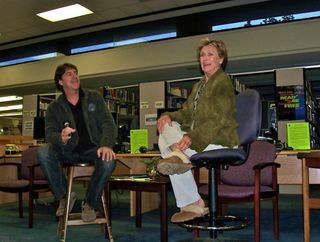 Actor/author/comedienne/Oscar winner/Rose Parade grand marshal/geriatric dancer Cloris Leachman showed her stuff at the Altadena Library tonight. Leachman, who will turn 83 Thursday, was in town to promote her autobiography. Here, she vamps for the audience and is interviewed by her son, actor George Englund Jr.